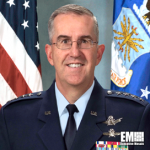 Air Force Gen. John Hyten, formerly commander of the Air Force Space Command, has officially started his new post as head of U.S. Strategic Command. President Barack Obama nominated Hyten in September for the role to oversee Stratcom’s missions in strategic deterrence, space operations, joint electronic warfare, global strike and missile defense missions. Hyten’s role at Air Force Space Command carried responsibility over how Stratcom, North American Aerospace Defense Command and other combatant commands organize, train and maintain mission-ready space and cyberspace forces and systems. “In the days to come, Stratcom’s mission will continue to remain vitally important to the bedrock of our security, and General Hyten will lead this critical team with the full trust and confidence of me, [Gen. Joseph Dunford] and President Obama,” said Defense Secretary Ash Carter.